The ATS Medical Pouch-Small is an advanced design that exceeds the current standard for individual first aid kits. When seconds count, standard trauma equipment can be difficult to access because most pouches stays attached to the vest or pack of the casualty. The most revolutionary feature of our Medical Pouch Small is that it can be instantly removed from its MOLLE compatible backing platform and then used independently as the situation dictates. This means that you don't have to roll the casualty around in the dirt or dump the contents of the pouch out to go to work on him. The difference could be life itself! The pouch is arranged as a "clam-shell" zippered design with elastic webbing on the interior in order to organize the trauma supplies in a consistent fashion. There's also has an interior slot pocket for smaller items. The ATS Medical Pouch Small will fit everything in the issue IFAK and more. The pouch features a red pull/carry handle to help designate the contents within as life saving equipment. The handle can be completely stowed between the pouch and the MOLLE backing panel when its not in use. It's features are rounded out by a cord loop for tie-downs and a drainage grommet. It can be attached to any MOLLE compatible system using our patent-pending L-Strap attachment system. The pouch measures about 7 inches tall, 4 1/2 inches wide and expands to about 5 inches deep, depending on how much is packed in it. It uses 3 channels and 6 rows of MOLLE space. 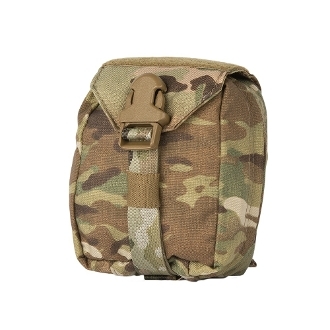 The Medical Pouch Small weighs about 9 ounces empty, due to its 500 denier Cordura construction.